Over-planning on a holiday, so many of us are guilty of this, I’ll go ahead and raise my hand first. We get so excited that soon that planning becomes a sort of maniacal need to cram as much as possible on a trip that’s meant to be relaxing. I have come home so exhausted after trips (and more often – on blog tours) that with planning a wedding and trying to remain a good friend/girlfriend, saying ‘no’ just as much as yes is sort of what the doctor ordered. But the thing is, traveling doesn’t actually need to be like that. You can choose to go a little slower, visit less cities and really get to know one given area, at least as much as a few days or week can allow. I actually hate the term ‘bucket list’ because of this ideas that place and experiences are meant to be ticked off like a grocery-store list. For the past few years, I needed to fall a little more in love with our nearby gem, the Chianti region, where yes that famous wine is produced. Obviously I could never argue that a famous place isn’t that way for a reason, I live just five minutes from the Ponte Vecchio after all. 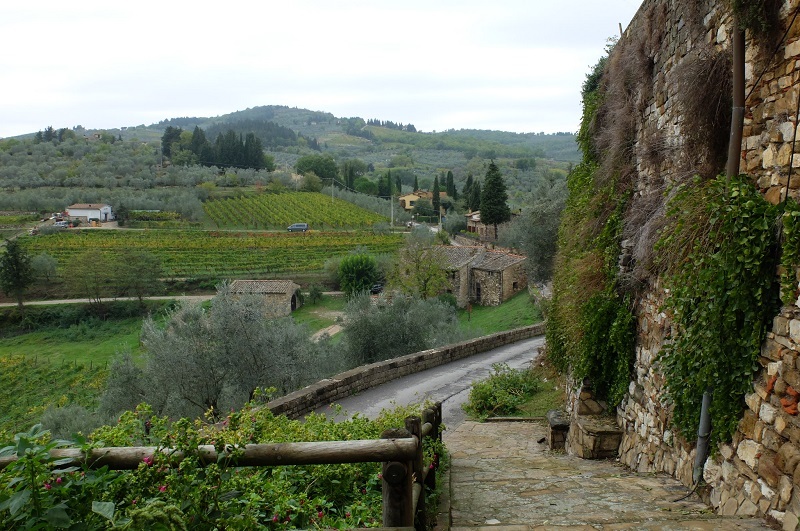 I just hadn’t been wowed by places like Panzano or Raddi in Chianti, choosing to go to towns in Val D’Orcia instead. But perhaps all it took was meeting the right people, and after I got a dinner invitation to have dinner with Maria of EaTravel – a girl from the Ukraine who organizes informal and inspirational small gatherings worldwide with her partner Tania and is a strong believer in slow travel and local food. 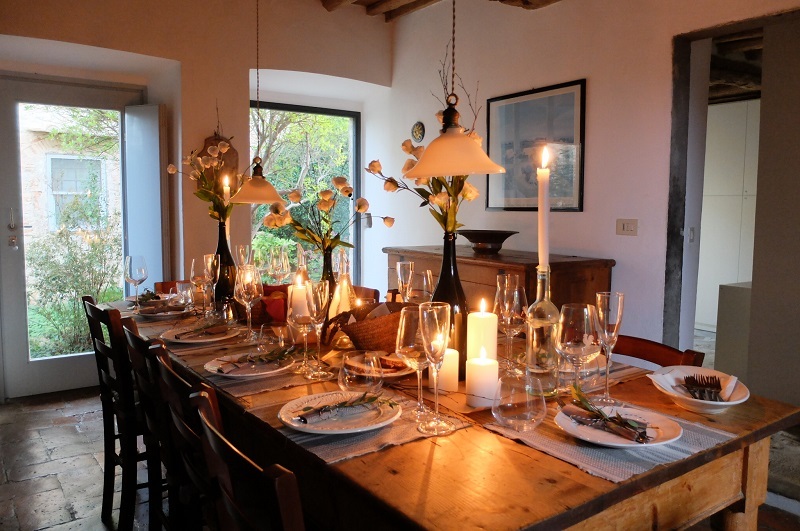 Together with a few blogger/instagram friends we went to her friend’s house in 45 minutes away from Florence in Montrogoli, a beautiful holiday home and ex “casa colonica” available for rent next to Chianti Classico vineyards and a private swimming pool with a view. The owners Arianna Cini and Alessio Di Genova (who met nine year’s ago in Bologna) live right next door on Arianna’s family’s estate and run a company called KM Zero Tours, aimed at giving people a local experience showcasing made-In-Italy artisans with an introduction to slow travel as a whole. Together with Maria had planned this dinner to have us meet some of the local producers they work with, we spent an evening of laughter and conversation. I sat next to Giorgio, a wood-carver who was lived steps from Niccolo who’s easy smile was captivating as he shared the perfectly-crisped ‘cecina’ or chickpea bread that Alessio himself makes. The dishes kept coming out, pecorino cheese with honey, more wine, fresh pasta and again, more wine. Everyone had a story at that table, and when I left that night, I was determined to come back and find out just what those were. To understand what Alessio and Arianna are about, you must understand the movement itself, as Alessia says “we want people to truly remember this experience, meet the people we meet and have a life-changing experience.” She herself is quite the trailblazer, at 28 years old, a qualified tour leader – she has plenty of life experience and even speaks fluent Russian. Alessio, who impressed me greatly in the kitchen also doubles as a third-level sommelier, having spent six years as a pastry chef in Bologna. We started a series about the slow food presidium on ITALY Magazine and I was eager to follow their lead. While I have known about it for quite some time, I really got a closer understanding by just how important the origin and passion of food is to them upon spending a day meeting their friends as we embarked on our adventure in their silver van. 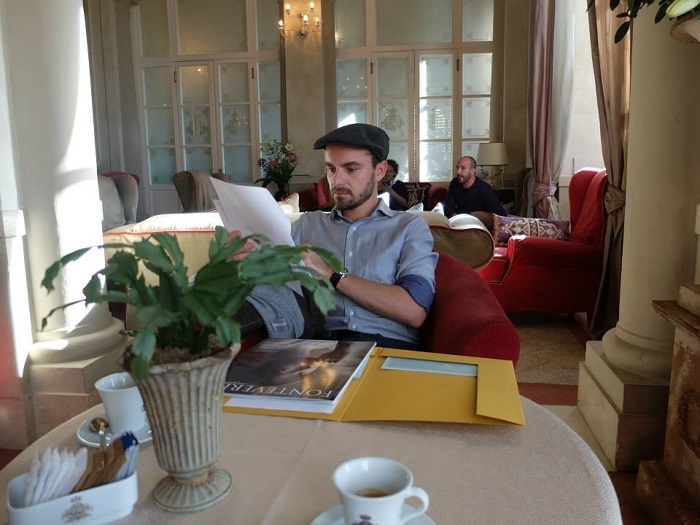 I also got an accidental education in Abruzzo, where Alessio comes from — a place full of tough men who he claims ‘never get sick’ and don’t represent the mammone (mama’s boy) stereotype we hear so often with Italian men. 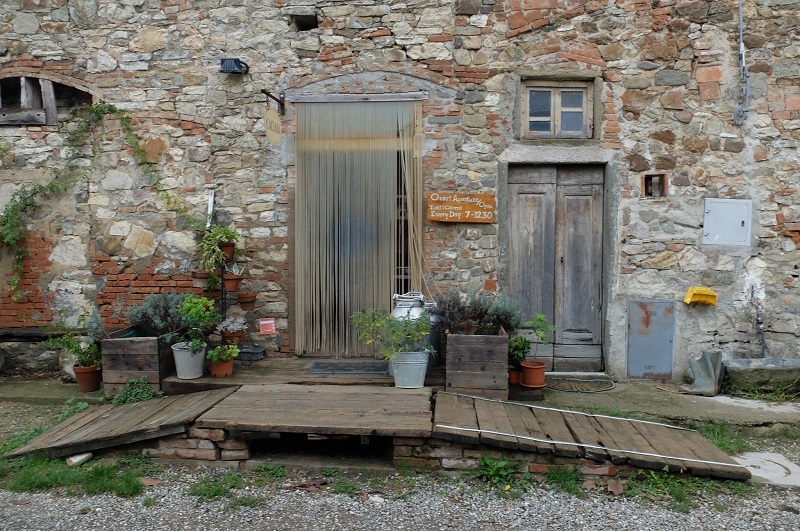 2 dogs, 100 goats, 4 cats, chickens and a few humans thrown into the mix, numerically sums up Podere Le Fornaci, our first stop on a journey of slow-travel in Chianti. Surprisingly enough this cheese farm is located only five kilometers from Greve in Chianti, yet feels a world away. The rough-around-the-edges spot is mecca to those who love goat cheese. 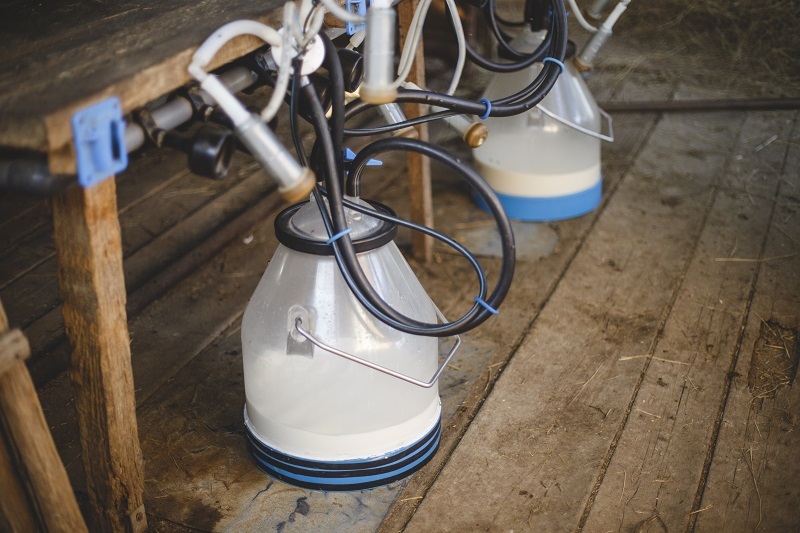 A group of like-minded people joined together to run the farm (and live there) with “bollo CE” (with European Market certification) where only the farm generated milk is processed. Lea was our tour-guide that morning, being a small-location literally everyone has their hands and heads in the muck. Luckily I had my hunter wellies on because it was quite a rainy day, and I splashed my way through the mud to say hello to the cute little goats, who are hilarious to watch in person. They were well-kept, googly-eyed and crunching on the hay that the Podere also produces on sight. One little guy even managed to wedge himself into a hay crate, eyes half-open in a blissful silence as he munched in his own little safe spot. 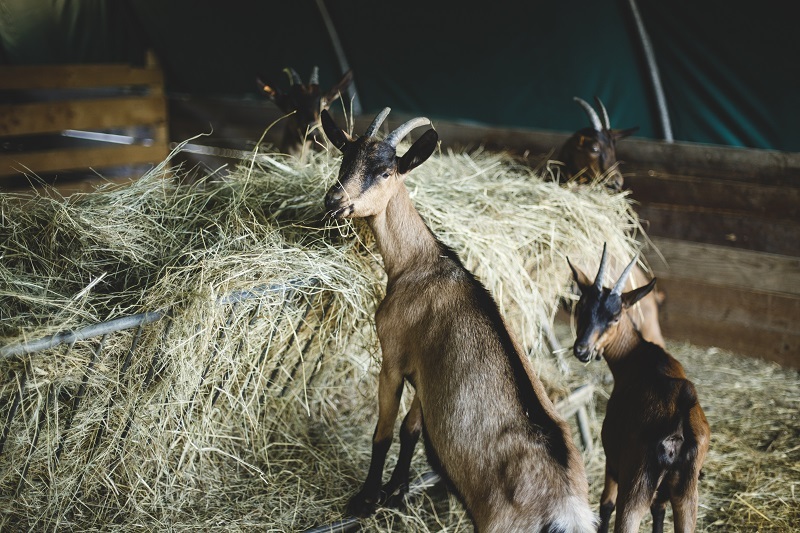 Cheese-making happens in spring, as per organic regulations including the stipulation that each goat must have one cubic meter of roaming space, which leads to the production of over 6,000 liters of milk this year. That’s a lot of cheese even for this girl. We headed inside to try some of their pride and joy, in addition to fresh goat cheese – they make ricotta and toma which ages at least twenty days or more. 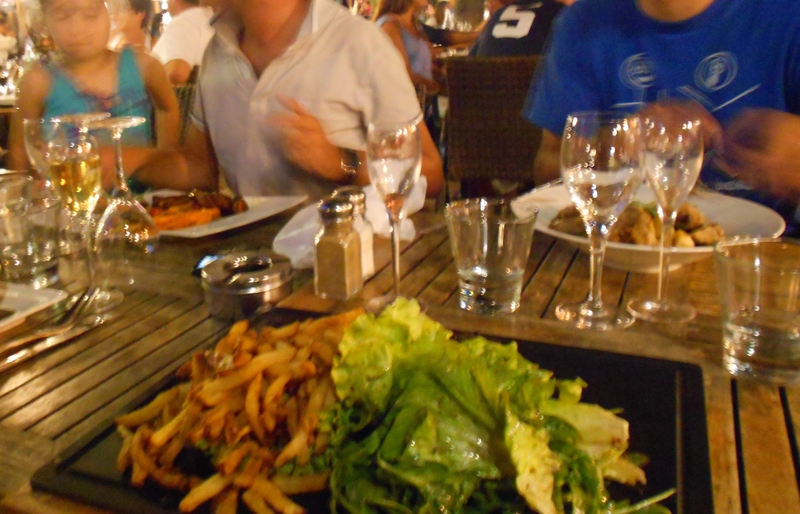 It was delicious, perfectly creamy –paired perfectly with some local honey and a glass of red, organic wine. For those who cannot get out to Chianti, they do sell their cheese at the organic food market in piazza santo spirito every third Sunday. It can also be found in Gastronomia Galanti, Il Fiore di Zucca shop, Sant’Ambrogio market and in the restaurant Aqua Cotta. I asked the best way to keep cheese, since I constantly hear contrasting advice and they told me to keep on a plate, not covered, in plain air on the fridge. Advice from the cheese-master’s themselves, perhaps not a good idea with gorgonzola (blue cheese) unless you like the smell of ripened feet. While it was hard to leave this pretty place, we had move on — so we hopped in the van to have lunch, first stopping in the charming town of Montefioralle. 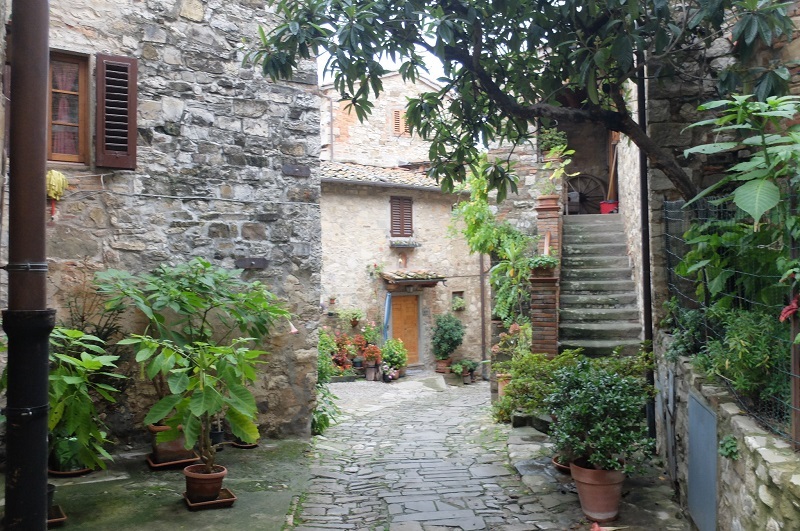 Before arriving in the center of Greve in Chianti, you can take the first road on the right that will take you up a hill overlooking the pretty landscape and into this charming village. The original name was ‘Monteficalle’ likely because of the fig trees that grow around the castle. Had I known what a beautiful site this place was, I would have skipped Greve long ago to come here instead. 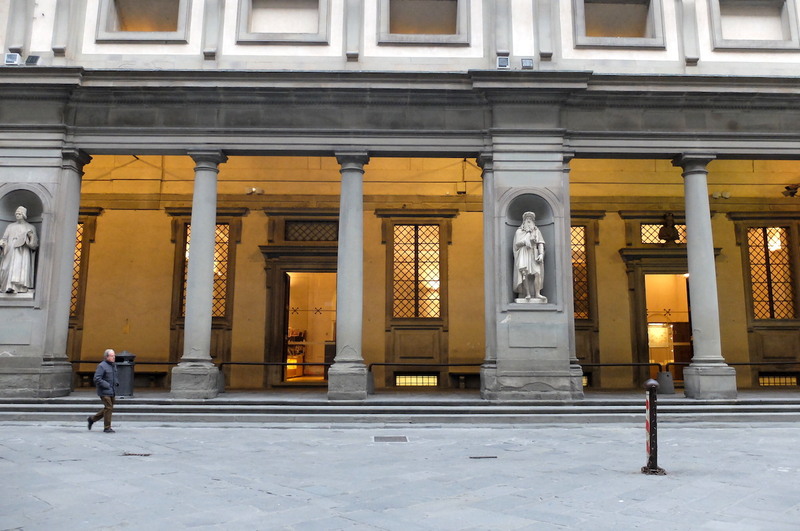 It also is the rumored birthplace of Amerigo Vespucci. Every March it is also home to a special food festival Festa di Fritelle following St Joseph’s day. A good excuse as any to eat this sweet, fried treat and visit a charming town that once was more popular than its famous, touristy neighbor. 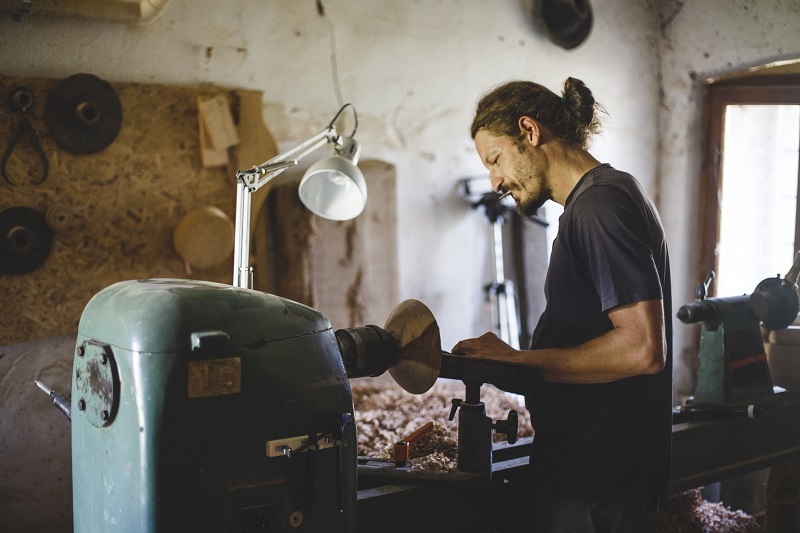 After lunch, we headed to the wood workshop of Giorgio Romani, an artisan originally from Abruzzo that has made Tuscan his home and embarked a self-taught adventure creating the most wonderful wooden objects. While you might often see cutting-boards and wooden objects sold in Tuscan towns, much of it isn’t actually made in Italy and instead is sourced from Morocco or other locations. As we walked up the drive, Giorgio came outside and told us he was pretty ill that day, contrary to Alessio’s claim that men from Abruzzo never fall ill ;-). He welcomed us in his little workshop adjacent to his home which was covered in a human-sized pile of wooden shavings. It was pretty impressive, as I looked around me, I could see every sort of tool imaginable to the eye, this place must be a man’s dream. With many wooden bowls, plates, works of art and various objects that he was currently working on drying in plain air all around him on various shelves. 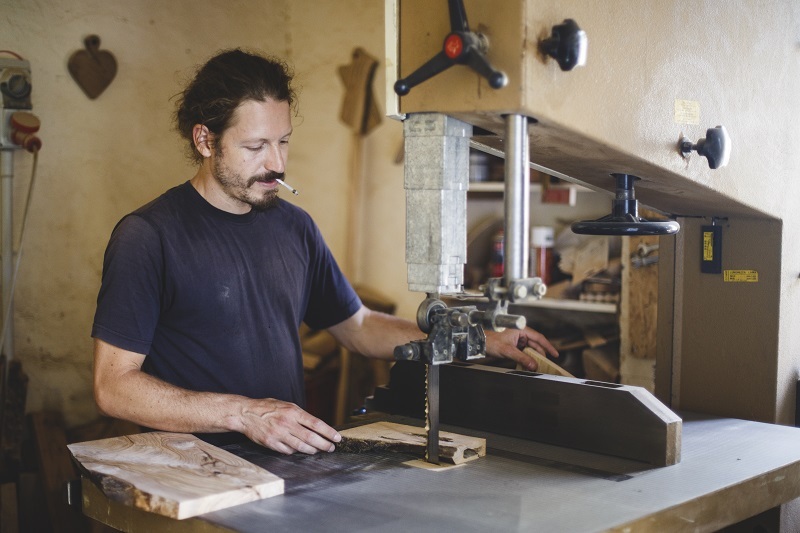 He started off as an apprentice in a furniture and cabinet making workshop, eventually moving onto wood-turning. We picked a safe spot and watched as Giorgio, with a rolled up yet unlit cigarette in his mouth grabbed a piece of wood and started his machine. The hum started as he started to slowly carve what was previously a shapeless block into a bowl, the shavings flying in every direction as he moved his tool expertly, carving and whittling away as I watched in awe. Humble as can be, Giorgio is as good as they get. We walked into a separate show-room where I got to see some of his more artistic pieces. I asked what he preferred to make and Giorgio answered “anything where my mind can wander” clearly referring to the sculptures he is commissioned to do (see above). 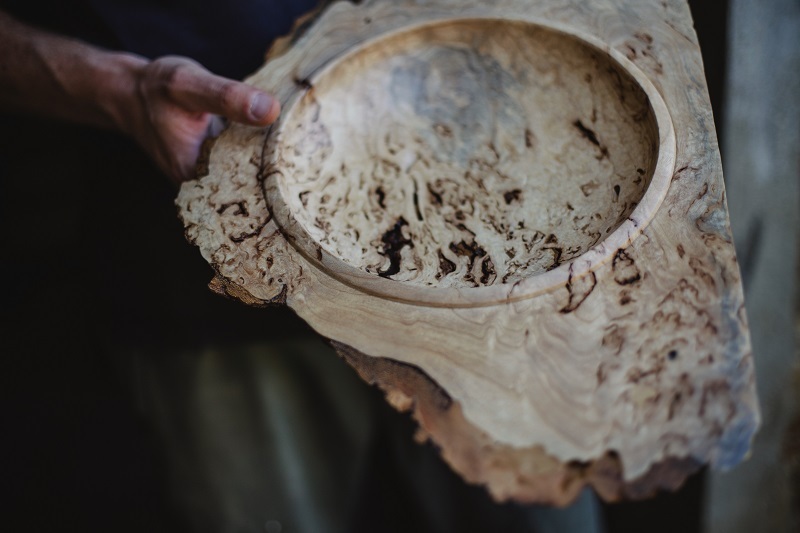 He works with all types of wood, not just olive trees and you can browse his online shop here. While I adore wine, wine tours can be a little tiresome after the 30th visit. You basically have the process down pat and though I am always interested in details, it is a bit of science thus I am more keen on seeing something a little different when visiting a winery. When we had the lovely dinner in Montogroli, I met a man named Niccolo who’s family winery was one of our stops this particular afternoon. The villa itself was built in the second half of the 400 and bought by Alessandro di Niccolò Antinori in the first half of the 500. It still belongs to descendants of the Antinori’s family, Niccolo and his mother Anna being two of them, they showed us around as we were members of their family. 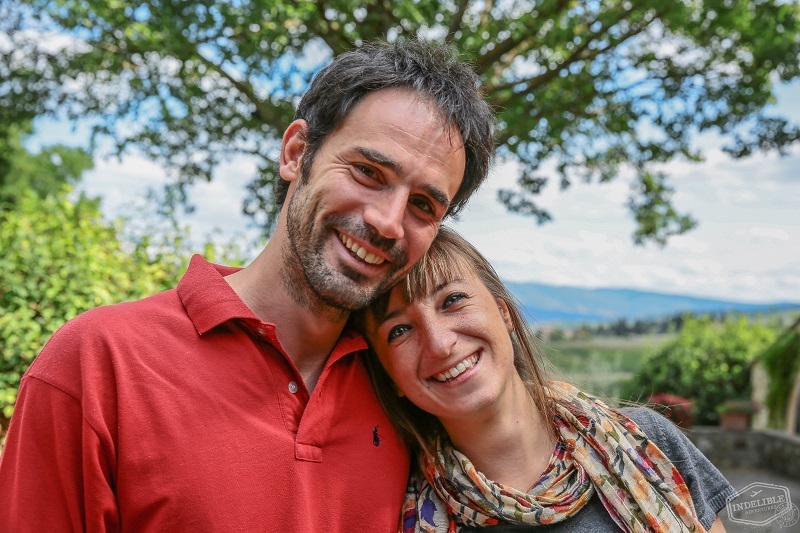 Smiling as they recounted all of the hard work that goes with running a Tuscany winery. The Renaissance villa is really impressive, with Giovanni della Robbia depicting on the coats of arms of both Antinori and Tornabuoni. The gardens itself reflect a more baroque style, when having a nice garden was essentially ‘in style’ as begun by the Medici family with the Boboli Gardens. 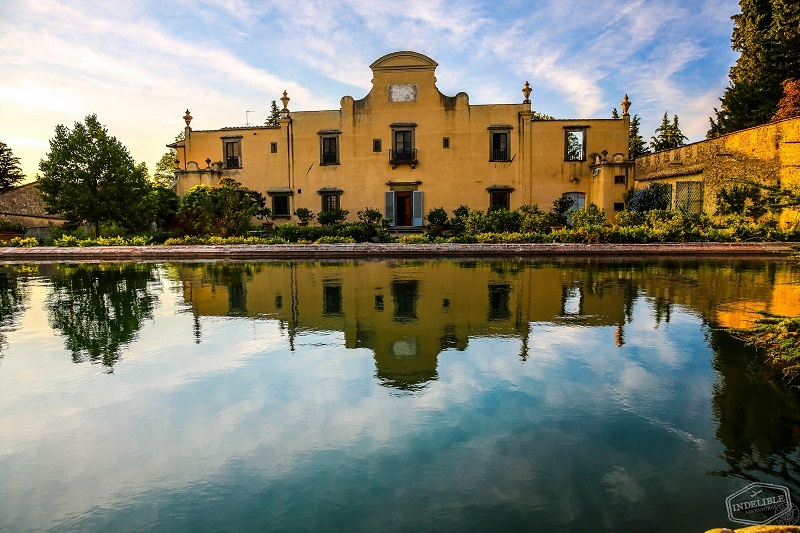 A great pool shows the most stunning reflection of the villa – next to an imposing nymphaeum of Neptune, decorated with river stones and shells. Photo credit: Terence Wallis – Indelible Adventures Inc. The grape varieties include Sangiovese, Canaiolo and Colorino while the wines produced are DOCG Chianti Classico, DOCG Chianti Classico Reserve, “Suganella” (IGT Tuscan red) and “Demodé” (IGT Tuscan rosè). A healthy list along with extra-virgin olive oil, grappa, and vin santo. The 2012 Chianti Reserve was my favorite, the perfect pair with a little wild boar or Alessio’s polenta from Abruzzo. We got a peek into the vin santo area, a Tuscan dessert wine storeroom that Arianna was very excited to show me. I soon understood why. 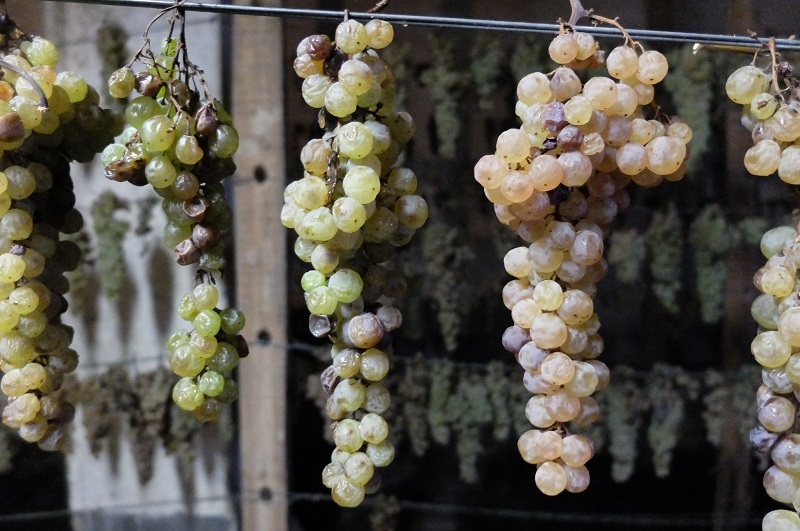 I have never seen how vin santo was made so to see the beautiful room with each individual grape bunch hung like a shining glory. It would stay like this for another few months before being placed in barrels. 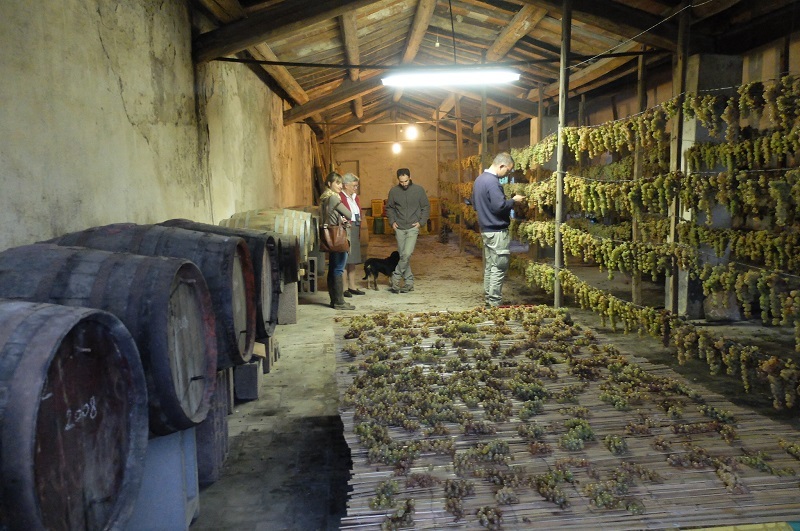 A precious batch that the year before was purchased immediately, finding decent vin santo is becoming increasingly hard — and they are one of the good ones. Anna, the signora of the house, was the most gracious host. Inviting us into a room with a glass wall facing the inner courtyard to try a glass or three or their wine, of which I was already a big fan. Anna and I share a love for Mexican food, I may have even provided her with my trusty guacamole recipe and we said goodbye as she handed Arianna a ripe quince fruit from a tree next to the vineyards. It was a beautiful day, transporting me into the world of many Italians, both locals and ‘new locals’ who have made tending the land or their craft into their livelihood. Something you tend to see less and less as many family businesses die out due to the heirs choosing more ‘fun’ careers in technology or elsewhere. I was inspired by their passion and love for what they do, and most of all for their connection to one another.Looking back at that first night, that long and incredible dinner cooked by Alessio, I was reminded of how close they all were, the easy jokes and gentle teasing. It’s enough to make you want to leave the city and buy a place in the countryside, or at least come up for a visit. I know without a doubt that this what Arianna wanted me to feel but I felt it the second a baby goat clamored up to say hello at the cheese farm. This idea of her’s and Alessio’s to not ferry tourists out for super-long day -trips but instead opt for a slower, more unique sort of experience is one that I really respect. 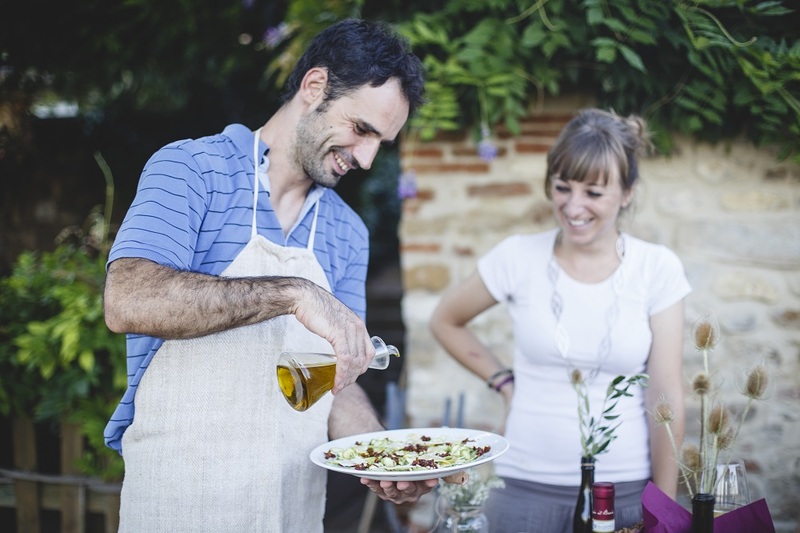 You can stay at their holiday home, take a slow-food cooking class, visit a pasta-making factory, pick olives, taste organic wine and just spend time with people that care about quality and having a great time. In a land where a quick google search will bring about any number of ‘top tours’ in Tuscany, I can assure you that they are the real deal. 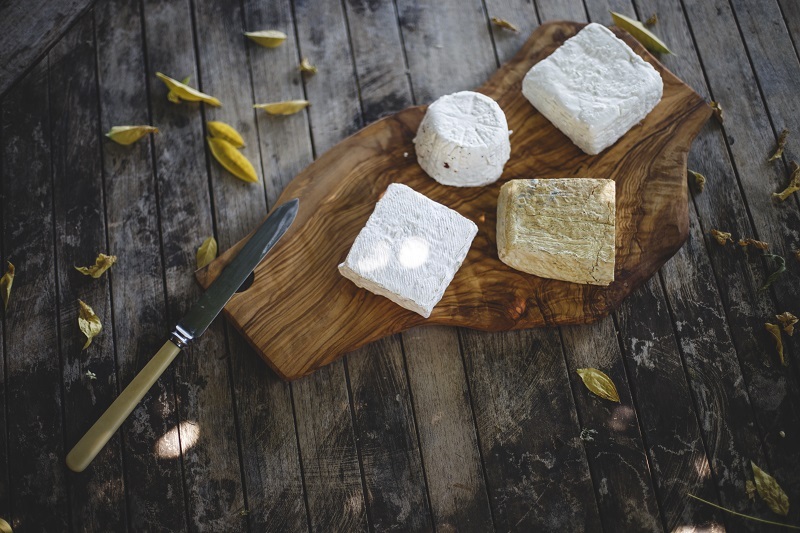 Cover photo credit: Terence Wallis – Indelible Adventures Inc.
Goats, cheese making, wood working, grapes…there is so much that I love about this. Thanks for sharing.